May Dreams Gardens has started up her 'Garden Bloggers Bloom Day' wherein you post on the 15th of the month what's blooming in your yard. I haven't had a chance to take pictures of what's blooming in my yard (I'll try to take some tomorrow), but my Dad, coincidentally, sent me some pictures the other day. He has 25 orchids blooming in his backyard. Yes, people, these are outside orchids. Did I mention that he's in a Zone 10 (San Diego area)? 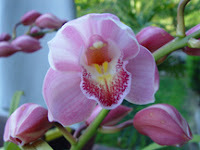 This beautiful orchid is a Cymbidium 'Cherry Ripe' Valley Flower with a clear pink 4.5 inch flower. And I thought things were a'bloomin' up here with the daffodils and cherry blossoms! Wow, orchids in the backyard. I have a few in my sunroom but I'm sure they would pale in comparison to orchids grown outside! Thanks for participating in the bloom day!